It would have been impossible for anyone not to know that Jose Mourinho got sacked as Manchester United manager on Tuesday morning. Following the match against Liverpool on Sunday, it would have been impossible for anyone not to understand why. It had become inevitable. The only real unknowns were when and how? Now they are known. It felt as if a hefty weight had been lifted off the club early on Tuesday, the figurehead of pity had been removed. The next steps for the club, however, will be the most telling and also the most difficult. Deciding how to drag United forward, up to speed with their rivals, is what’s next. 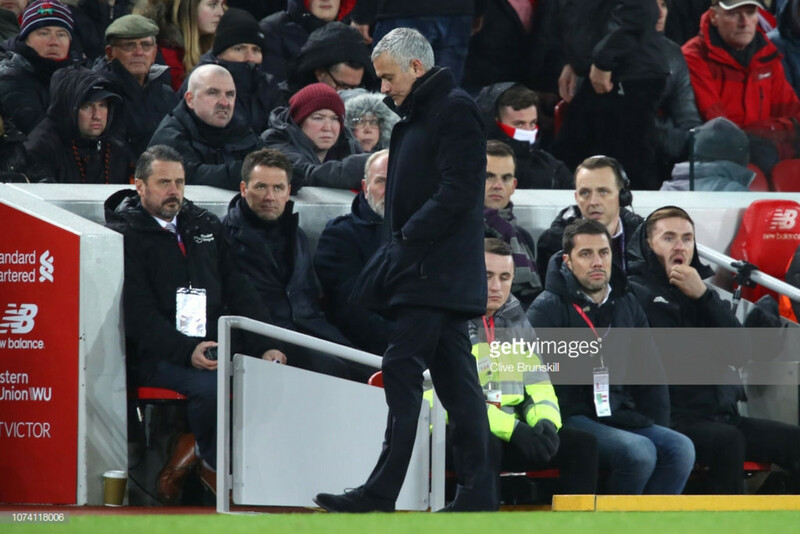 Mourinho was a symptom of the structural problems at United, not the cause. Although the malaise of both club and manager are separate, surely one did not help the other. The sooner this impending deed was done, the better…for both. Mourinho was never an ideal fit for the exuberant and entertaining United. Yes, he had himself been a compelling young manager once upon a time but his football has always been on the pragmatic side rather than the pleasurable. The appointment of Mourinho was in many ways an uninspired choice by Ed Woodward, United’s Executive Vice-Chairman; it was very much a case of keeping up with the Jones’ and, in this circumstance, the hullabaloo of Pep Guardiola arriving across town at Manchester City. What Mourinho did slowly instil at his new club, and in particular the past 12 months, was a fear in the players. His approach has always been to eliminate the mistakes made by his players on a football pitch but that has had an opposing effect at Old Trafford. The defensive block aimed at preventing opponents from creating anything seriously dangerous close to the United penalty area has not worked as planned, or as well as it had done before. Only Huddersfield have conceded more goals than United this season. But the fear of making mistakes has manifested in this current United squad. Whether it be in defence or attack, there is a reluctance to take risks consequently leading to mundane football seemingly without a direction, plan or courage. Eliminating individual errors in defensive situations is fine but removing the carefree attitude when attacking is problematic. By its very nature, when forming an attack there must be an element of imagination and risk-taking; by condoning the making of mistakes, Mourinho turned a bunch of talented forwards into shaking nervous wrecks whenever they entered the opponent’s area. Full in the knowledge that too many mistakes would cost them their place in the starting lineup. Naturally, this enforced shun of creativity and unwillingness to encourage expression on a football pitch, led to friction between coach and players. When Mourinho was at the early stage of his coaching career, he prided himself on being able to rally players who felt hard done by, attempting to get them to prove that they did deserve where they were. At United, this tactic failed. It would have been hard to get this type of message across to academy protégés who’ve had agents since the age of seven, contracts since the age of ten and marketing campaigns based around them since the age of 14. Asking them to adapt a siege mentality proved useless and ineffective. Failing to adapt his approach was ultimately costly for Mourinho. His on-field tactics would have been given a fair amount of slack had his off-field dealings been more serene. As seen with Eden Hazard and Oscar during his second spell at Chelsea and with Paul Pogba at United, Mourinho is not the type to put an arm around a youngster’s shoulder. Instead, he demands a lot, plays the bad cop role and resultantly induces fear. Pogba, perhaps, is the point in case that rings the truest. Two big egos colliding it may have been, but the way Mourinho pushes is not the manner in which many modern day footballers want to be encouraged to perform. His forthright approach does not sit well for some and seemingly turned many off. Mourinho’s decision to continually criticise his players in public cannot have been good for the relationships in the dressing room. His attempt to always deflect the limelight from his players appeared to eventually have quite a contradictory effect. Mourinho struggled to deal with the millennial footballer, they are very different from the type of player he was dealing with in the early 2000s. Beyond Mourinho’s philosophy of how a manager should work, the workings of United in its entirety should be where the real scrutiny lies. When a football club drifts and lacks direction such as United have for some years, there is no sole individual entirely responsible. Since Sir Alex Ferguson and David Gill left the club back in 2013, United have had three full-time managers, along with a plethora of playing talent come and go, and yet the footballing identity of United appears to have dissipated in double-quick time. There are still five months left to run on the contract given to David Moyes as Ferguson’s successor. Whether it be that the Glazers, United’s owners, are increasingly only concerned about running United as a business, and consequently Woodward only operates with that mantra, is certainly true. What made this sacking only slightly surprising was that United’s weak board didn’t wait until it was mathematically possible for them to qualify for next season’s Champions League. There are no immediate signs that United are going to challenge the likes of City and Liverpool any time soon. The appointment of a Sporting Director will at least offer some sort of long-term planning. What Mourinho must be given credit for is that he became the figurehead of United in recent years – albeit one of pity than success. He was the only one strong enough to take the brunt of the criticism coming United’s way; the players, owners and board have more questions over their heads. The supporters, however, do not; remaining with the manager and, of course, the club right through the entire debacle. For their sake at least, an increase in impetus at United both on the pitch and in the boardroom cannot come soon enough. Taking the challenges that United now face head-on, is what is needed. Mourinho was not the right person to do that and increasingly that became apparent; the point of no return had passed. Mourinho’s time also seemingly has. But again United’s current situation is not down to one man; along with the structural review of the club, the dismissal of fear, friction and scapegoating and the appointment of a new, progressive head coach there must be unity to take this club forward.